The old Range Rover Evoque was a big departure for the brand, offering something compact, stylish and fairly capable—and even a bit curious when it comes to the coupe and convertible. 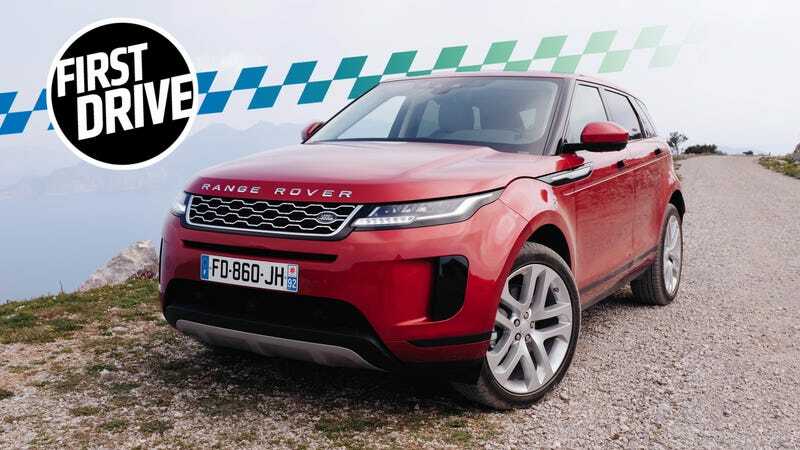 The new 2020 Range Rover Evoque has lost a bit of its stylish charm, but it remains a car that can be bold and still get out any rough conditions it gets itself into. The Evoque has always had possibly the greatest challenge of any other car in the Land Rover lineup. It’s the most affordable and the smallest, but it’s still got to offer the practicality and premium styling expected of its bigger, more expensive siblings, along with at least some off-road competence—even if that’s never put to use by its owners. Where the first generation Evoque assaulted you with stylish flare, with the rounded wheel fenders bending into the hood, the tight headlights, and the converging lines of the lowering roofline and rising shoulder, the nearly all-new 2020 model has matured just a bit, in style, technology and practicality. The new Evoque is the second-generation of the compact premium crossover. This time there will not be a coupe. There will not be a convertible. You get it with four doors, five seats, and that’s it. Only about two percent of people ever bought the coupe, anyway, or so I’m told. The company can’t play those games anymore. The new one adopts most of the current design language exhibited on the Velar—much of which started with the original Evoque in the first place. Time is a flat circle. But it also means it blends in a little more with the rest of the lineup as they’ve all upped the style game lately. The outgoing car sold very well in Europe, fairly well in America, and the new one has to try and improve on that, so how does it fare? The new Range Rover Evoque will be shipping to dealers soon, offering two 2.0-liter four-cylinder engines: a 246 horsepower P250 and the 48-volt mild hybrid 296 HP P300. The mild hybrid setup on the P300 only engages at speeds under 11 mph, effectively boosting torque at low speeds working as a sort-of advanced start-stop system that’s designed to be a little more seamless. The additional power over the P250 model comes from boost, and not the electrical system. All-wheel drive is standard as is driveline disconnect, which can drive the vehicle only by the front wheels to reduce frictional losses on the drivetrain. All Evoques get a ZF nine-speed automatic transmission. The P250 gets from 0 to 60 mph in 7 seconds with a top speed of 143 mph and a curb weight of 3,935 pounds, and the P300 in 6.3 seconds with a top speed of 150 mph with a curb weight of 4,075 pounds, according to Range Rover. For off-roading, there’s now an automatic terrain response mode that will cycle through the various surface drive settings depending on the conditions the car is experiencing. Wading depth has increased from 19.7 inches to 23.6 inches. Ground clearance is 8.3-inches, with a forward approach angle of 25 degrees and a rear departure angle of 30.6 inches. The new ClearSight Ground View Monitoring system, which shows the driver where the wheels are located through a video feed on the infotainment display, is not part of the 360-view camera system. Driver Condition Monitoring, emergency braking, lane keep assist, and a reversing camera are all standard. I liked this little new Evoque. On the outside, it’s sleeker and smoother than the old car, with just enough straightening out to not be so flashy but still catch your eye. R-Dynamic models get nice bronzed accents around the hood that go really well with the greyer color options. The car sits on a new platform and is overall just over an inch longer, so it doesn’t look too much bigger than the outgoing car. The wheelbase is also a bit longer, making the proportions work a little better with improved interior packaging. Inside, it gets the now-familiar dual-screen infotainment setup. I also dug the relatively slim-width-ring steering wheel. The most common functions get physical controls, including climate control and volume, and those physical controls switch based on the main menu you have selected on the lower screen to then change dynamic drive modes for various road surface conditions. The same happens on the steering wheel controls, with little screens that change symbols with the various functions. In theory, this makes for minimal tapping, while providing the option for most of the functionality to come from physical inputs. We will return to the infotainment stuff in the “Not So Good” section soon to come. The interior layout also has a luxurious and premium feel, and the materials are all mostly nicely textured and not abusive to touch. The first car we drove had a navy blue stretch of leather on the dashboard and in the seats, which was great. The other car had the Eucalyptus Melange eco-friendly interior, and it was just as nice as any leather you’d find. Driving the lower P250 model Evoque on pavement is pretty good, with the standard suspension gliding over the surprisingly well kept roads of Athens. It does wallow just a bit, but that’s better than the opposite extreme of breaking your back over a speed bump. The 246 HP was good enough. It does leave you a little wanting in a passing lane, but otherwise, it’s just good enough. Through the twisties, though, the standard suspension is a bit of a let down. Punching it out of a traffic circle lead to some understeer with the subtle threat of snap oversteer at one point, though nothing that isn’t manageable by anyone paying attention. But it kind of kills the mood in the rest of the corners, too. The optional Adaptive Dynamics suspension setup with adjustable dampers on the diesel we drove, (the diesel part we won’t get, so ignore that), was a noticeable improvement. You lose none of the off-roading functionally and gain enough tightened control to actually enjoy yourself on a good road. This was also the only way to get any real feedback out of the steering, though it was precise on both cars I drove regardless. If I was personally buying one of these things, I feel like I’d have to check the adaptive damper box. When the new Evoque was first announced, a lot of people were very excited about the trick camera setup that let’s the driver “see through the hood” of the car. The benefit of this is a camera stitching together the view of three cameras which lets you see pretty much exactly where your wheels are below you, and watch what rocks or other obstacles or ruts are down there. Using this system, my co-driver was one of the only journalists at the event to get around a tight mountain corner—where it was advised we do a three-point turn—in just one fell swoop. I am a very trusting person, maybe too trusting, but it worked out this time. Also, he let me drive us over a railway bridge crossing a deep canal the day before, so we were even. The Evoque also now gets an optional digital rear-view mirror, which offers a 50 degree field of view. This comes in handy considering the number of complaints about rear visibility on the outgoing car. Goodbye C-pillars. And passenger heads. And that bulk sized toilet paper pack in the back. The feed comes from an adjustable camera embedded in the shark fin on the roof of the car. You can also switch to a traditional mirror if you need to check your hair. This being a Range Rover event, of course they had us do some off-roading. They’re pretty good about that. I drove through a rocky “river” bed that was more of a flowing creek, but the car had no problems and no popped tires, despite them repeatedly telling me I was going too fast. Then we drove along some gutted gravel mountain roads, being sure to avoid the goats and their shepherds, and again it felt almost too easy to be so adventurous. That just meant we could actually look out and enjoy the stunning views and argue over which sea we were currently looking at. The car’s updated Hill Descent Control, Gradient Release Control, and All-Terrain Progress Control got us up and down some rocky, dusty hills with absolutely no problem, and it felt almost too easy. It’s hard to imagine real people actually using this, but should you find yourself in that position, being able to worry less about throttle and brake management and more about not damaging your expensive crossover is probably a bit of a relief. Let’s come back to that infotainment system. The touch response on both screens is still bad, just as it was on the Jaguar I-Pace and Range Rover Diesel I’ve tested previously. (Other Jalopnik staffers have had similar complaints on other JLR cars too.) Everything has just long enough of a delay to make you press twice, and there’s no sort of physical feedback. Here’s hoping JLR’s engineers get around to figuring something out soon. Cars not equipped with the digital driver display also force you to keep some combination including the navigation map on the upper dashboard screen, which means you have to look over. We’re closing in on a point where it’s inexcusable for a premium car to not have either a digital driver cluster or a heads-up display as standard. I also asked if the Evoque can get over-the-air updates, and it can, but only for the infotainment system. This probably means that any new vehicle built on this new platform for the next few years will be stuck with the same limited remote update capability, and that’s a shame. But if you didn’t miss it before, I suppose you won’t miss it now. Finally, it’s very disappointing that the U.S. is not getting the plug-in hybrid variant of the new Evoque, which is otherwise a global model. All we get is the P300 48-volt system car along with the P250. But maybe one day. With prices starting at $42,650 for the base car and going all the way up to $55,800 for the top R-Dynamic HSE P300, the new Evoque is positioned to compete well against a growing and immensely popular class of smaller luxury crossovers like the Audi Q5, BMW X3/X4, Mercedes GLC and so on. If you’re the sort of person who wants to drag your family out of the safety and security of your civilization, thinking it would be refreshing to get away from it all for a bit, only to realize you’re going to put everyone through something they weren’t really prepared for, the Evoque can manage such excursions and still actually look good doing it. The 2020 Evoque’s interior is a fine place to be, the cabin noise is super quiet even on windy seaside roads, the ride is comfortable with either suspension setup, and the base car’s power is adequate, with more available if you want to get to the gym early so you still have time for that power smoothie, or whatever. The rest of the time it’s going to be a solid compact premium crossover that’s a little more capable over the rough stuff than most of its competitors. Correction: An earlier version of this review listed the new Range Rover as a 2019 model. It is a 2020.